The patented Extinguish Stick was designed for use in space because it leaves no residue, is not pressurized and is maintenance free. Now this space age technology has been made available to everybody across the map. 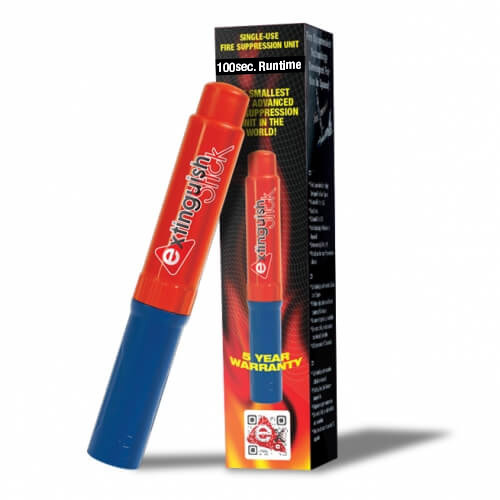 The Extinguish Stick is environmentally friendly, comes with a five year warranty and is so easy anyone can use it. This paired with the compact size makes the list of applications endless as it can fit anywhere and will be ready whenever you need it. The Extinguish Stick is a "State-of-the-Art" cutting edge fire suppression technology based on decade's old proven science. It is a single-use fire suppression device that initiates a non-pressurized aerosol delivery system that puts out fires quickly and efficiently.